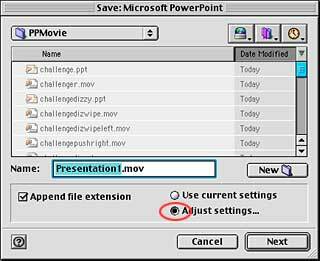 Besides helping you to create a slide show, Powerpoint presentations can be saved as a small (file size) movie. Open Powerpoint and choose the blank slide layout. We'll build this first slide show movie from scratch. Note the many template possibilities; to add charts, tables, images and bulleted lists. Powerpoint also has a Project Gallery with a wide array of predesigned Themes to choose from. 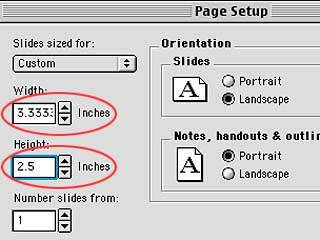 Choose Page Setup... from the File menu and enter your choice into the width and height fields. Orientation for a text movie is probably best as Landscape. Backgrounds, fonts and font colors can be changed globally in the Slide Master view. Delete extraneous text boxes, then resize and format the Title text box that remains. Any element on the Master slide will appear on every slide in the slide show/movie. Type your quote into the left hand column of the Normal View. Break your quote/credo into shorter segments so you can transition between thoughts. To create a new slide, hit Return on the keyboard. Navigate to another slide by clicking the small slide icon alongside its text. 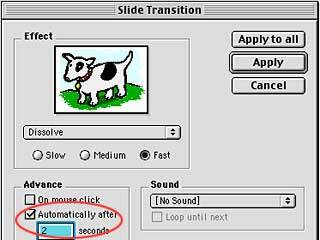 Select the slide icon to apply a transition for that slide into the next. Choose from many possibilities in the pop-up menu. K.I.S.S. applies here. Consider the best way to display and integrate your quote, tastefully and coherently. 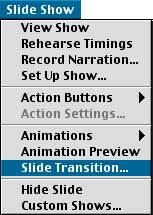 To further tweak your Transition, choose Slide Transition... from the Slide Show menu. Normal View is best for creating slides, entering text, tweaking the fonts, colors and transitions. 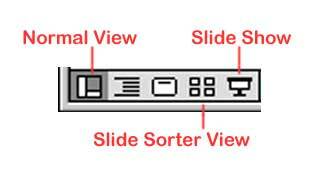 Slide Show Sorter will allow you to quickly rearrange the slides, see the transitions, and eyeball text positioning and size from slide to slide. Slide Show previews your slide show full screen. 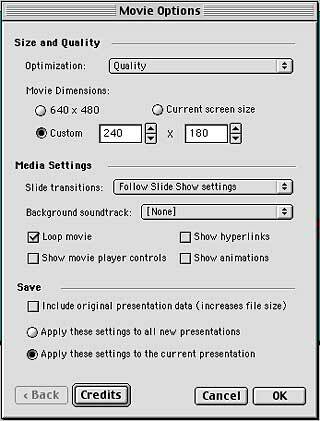 Once you are satisfied with your slide show, you can export a movie with the same transitions. Choose Make Movie... from the File menu. Navigate to your folder and name it "quoteXX.mov"
Choose to Adjust settings... and click the Next button. Match up your target dimensions for the final movie. When your Movie Options match these, click OK. Your movie will be rendered to your folder. Double-clicking on the icon will Open it in QuickTime Player to view. Next: How to add this movie to your splash screen.